Only the alkaline Sodium Ascorbate is recommended for intravenous vitamin C infusions. Note: This product is intended for oral use. Sodium ascorbate is a form of vitamin C that has been bound to the mineral salt sodium. The basic properties and health benefits of sodium ascorbate, (it is vitamin C), are virtually identical with ascorbic acid, but the mineral salt buffers, thus lowers the acidity of ascorbic acid. The buffered sodium ascorbate may enter the blood stream more slowly than ascorbic acid when taken orally. Or order by calling 800-894-9025. 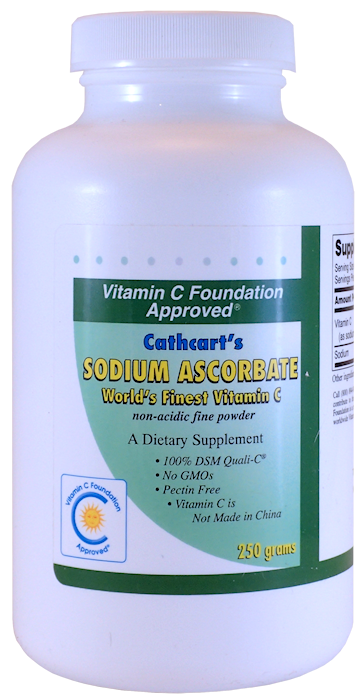 Ascorbic acid (hydrogen ascorbate) is highly reactive, and Cathcart felt it is the most powerful and fastest acting oral form of vitamin C.
And there is another reason to take at least some of your vitamin C as sodium ascorbate. As we age, it can be harder to take pure ascorbic acid by mouth. Cells in the stomach are used to a highly acidic environment, but sometimes lesions form at the bottom of the esophagus, as tissues leading to the stomach are not acid protected. Both forms of vitamin C, ascorbic acid and sodium ascorbate have similar health benefits. If you experience discomfort while swallowing, and are not fighting the cold or the flu, sodium ascorbate powder can be an excellent choice. Physicians please note: The literature often incorrectly mentions "ascorbic acid" intravenously. The solution must be buffered to a pH around 7. The only form we recommend for IV/C is Sodium Ascorbate. The late Doctor Robert Cathcart, III, the world's foremost expert on use of intravenous vitamin C, followed in the footsteps of the pioneer Fredrick Klenner, MD. Dr. Klenner's paper often referred to his injections as "ascorbic acid" but Dr. Cathcart verified with Klenner's nurses that Dr. Klenner only used a buffered ascorbic acid or the non-acidic sodium ascorbate. Sodium Ascorbate is the only form of vitamin C recommended by Cathcart for intravenous and intramuscular use. I have not had any trouble with sodium ascorbate solutions. I do not worry about the sterility of this because this solution is very bactericidal. I hear all sorts of weird stories from patients who have gotten their infusions elsewhere. I do not know if it is an acid problem (because ascorbic acid was used rather than sodium ascorbate) or whether some colleagues get carried away with what other things they add to the intravenous solutions. I think that there may be, at times minor troubles with commercially prepared solutions because of the following. I understand that the U.S. Pharmacopoeia specifies that the solutions be made from ascorbic acid and then buffered with sodium hydroxide or sodium bicarbonate to a pH between 3.5 and 7.0. I worry that 60 grams of ascorbate at a pH of 3.5 is too acid. I know that Fred Klenner (the first physician who used high dose intravenous ascorbate by vein) also made his solutions from sodium ascorbate powder. The pH of this has always turned out to be 7.4. 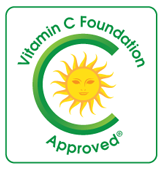 The Vitamin C Foundation only recommends sodium ascorbate IVCs. Clinical physicians have reported profound differences in the potency and patient reactions between sodium ascorbate prepared according to Dr. Cathcart's instructions and the more mild reactions from the standard commercial buffered ascorbic acid products sold for injections.